What does FHA Approval mean when shopping for a condo? FHA financing is a popular choice for many of our buyers in the Hudson Valley. It makes the purchasing process more of a reality for many people that would not qualify otherwise. The low down payment makes this option a sweet choice for those looking to get into a home with little money out of pocket. The hardest part for so many first time home buyers is getting together a down payment. New York State is known for higher closing costs than many other locations and with FHA it makes purchasing a home affordable. 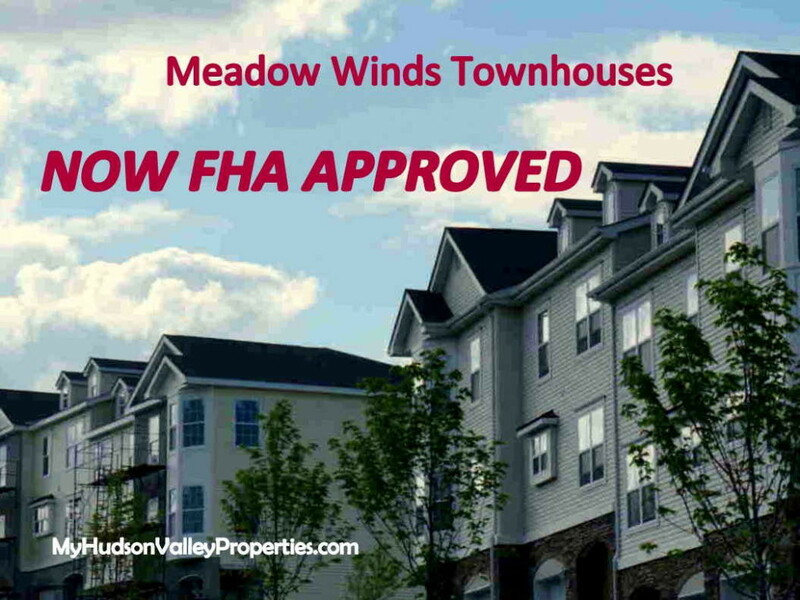 Now that Meadow Winds Townhouses are FHA approved we expect to see many buyers scoop up these homes fast. Many people ask what it takes for a condo project to get the FHA approval. The guidelines have changed, but the basics involve the following. FHA requires that the condo project is a secure investment. Who would argue the value in that? They make sure that all homeowners are up to date with HOA fees and that the owner occupied numbers are at a low ratio of owners living in the units to those that are rented out. FHA frowns on any pending lawsuits. These are reasonable requirements and anyone buying a unit should be happy to know they have this security. Cash reserves for the association are also part of he process when FHA reviews all the HOA docs for approval. This is all a simplified version of the process, but for the most part these are the details that a home owner would value. Once the approvals are in place this increases the value of the project and resales are easier for current owners too. The project remains approved for over two years, and the HOA must go through the renewal process when the expiration time is near. It would be up to the owners to vote to keep the certification, but important for when anyone wants to sell their property. New York State has high closing costs and taxes so a low down payment and access to the FHA financing helps with selling any condo. The process to renew is so much easier than going through the approval phase again. Many local communities don’t keep up the certification but regret this when an individual wants to put their home on the market. Orange County NY has very few FHA approved communities but on Orleans Drive at Meadow Winds, lucky new buyers will find that financing a home has become so much easier! We predict with this new financing in place that the condos won’t be on the market very long. Our last phase is under construction now and we are already with contracts out on two of them. Don’t miss out on this great new opportunity. We have been waiting a while for these approvals and now those that were refused financing in the past will be back for a second look. New Construction continues at Meadow Winds. Call for more details on financing and to schedule an appointment to see the new homes now. Call Janis at 845-527-7115.